ClearBox Enterprise RADIUS Server is a software created by XPerience Technologies. This is a protection tool for the user's Wi-Fi network. It allows centralizing authentication and administration of the connected computers. Policy: The program has various independent policies for performing authentication. It offers the user the possibility to define a policy in three ways which are by user name, by RADIUS client address and by attribute matches like presence, absence, equality and so on. Data sources: ClearBox Enterprise RADIUS Server can also handle multiple data sources. The user will be able for instance to use different databases like MS SQL Server, MySQL, MS Access and Oracle. Login: This utilitarian is also equipped with a built in state server which can be used to know what other users do. The user can reduce the number of persons that are logged in. He can also specify which one is allowed. 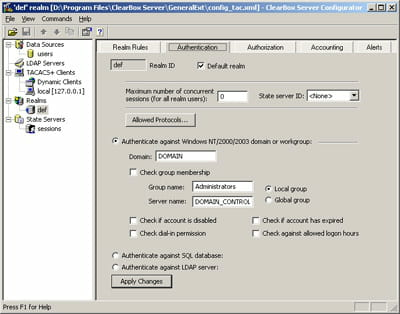 ClearBox Enterprise RADIUS Server is a simple and easy to use program for it has a very intuitive interface. It is also integrated with a billing system. Latest update on July 31, 2015 at 05:50 AM.